ST. LOUIS - Napheesa Collier figured there would be a homecoming game in her future with the UConn women’s basketball team. She just didn’t know where in her native Missouri it would be. “I’m just happy there was someone willing to play us,” she said. That someone proved to be Saint Louis. 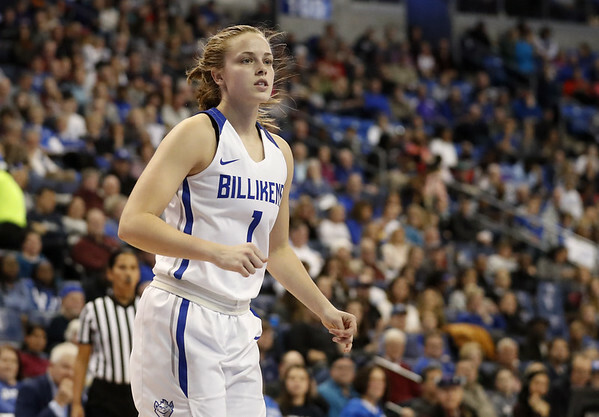 The young Billikens were overmatched in every area as the top-ranked Huskies coasted to a 98-42 win before a crowd of 7,105 at Chaifetz Arena Tuesday. But while Saint Louis lost on the scoreboard, it won the appreciation and the respect of UConn’s coach. “It’s difficult when you’re the home team and we come in and the crowd came to see us,” Geno Auriemma said. “It’s the biggest crowd you’ve ever played in front of. A lot of times you can get caught up in it and the younger you are the more it can affect you. I was really impressed with how hard they compete. As young players they’re not ready to win a game like this. UConn has had issues finding homecoming games for some of its players, notably Breanna Stewart. The Huskies wanted to play Syracuse three years ago but were turned down by the Orange. They eventually played at Colgate. Posted in The Bristol Press, UConn on Wednesday, 5 December 2018 21:17. Updated: Wednesday, 5 December 2018 21:19.